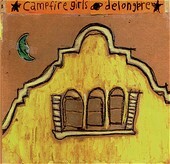 Crunchy, guitar-rock with plenty of momentum, the Campfire Girls' deliver it like it was meant to be, straight out of the early to mid-90s: well-produced, retaining its imperfections, laden with rock, and still poppy enough to hook you while the guitars buzz away. It isn't alternative, and it isn't grunge, but what it is is solid rock 'n' roll with a lot of melodic sense. Delongere is packed full of thirteen equally chunky, bass heavy, guitar-soaked rock songs that are fueled by the noise and happy to be so lucky. I'll give it a B+.